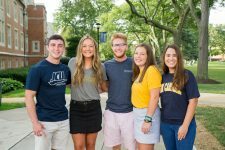 John Carroll University offers group visits that cater to high school* or college age students from high schools, community colleges, college access organizations, and community-based organizations. Offered Tuesdays through Thursdays, May through February. Please allow at least two hours for your visit to campus. Visits typically include a campus walking tour and an information session. Group visits are designed for 10 or more students and are limited to 50 students. We are unable to provide meals or transportation for your group visit. Visits may be limited on select days due to campus events or other visiting groups, so please have alternate dates in mind when completing your request. Please schedule your visit at least two weeks in advance. Someone from our staff will follow up with your request generally within 2-3 business days. Walking tours are one hour unless otherwise modified for your group. Plan to wear comfortable clothing and shoes. Please plan to arrive at least 15 minutes before your visit so that our staff can provide you with the full John Carroll experience that you have scheduled. Please be prompt, as students may need to complete visit forms upon arrival. Group visits are designed for 10 or more high school students, and are limited to 50 students. Chaperones from your organization must accompany your group at all times. We request one chaperone for every 10 students. We are excited to host your group on campus and hope to provide a meaningful and pleasant experience for everyone. John Carroll a university with a commitment to providing an inclusive and welcoming environment. Please ensure that your students show the same respect to our students, faculty, and staff. Students and chaperones should not talk or text on their phones, listen to music, or be engaged in other activities that take their attention away from the professional enrollment staff member or student tour guide. Should you need to cancel your group visit, kindly contact Natalie Robinson at 216.397.4252 at least five days before your scheduled visit date. *If you are interested in bringing a group of students younger than high school age, please complete the form and we will reach out to you. These visits are approved on a case by case basis.